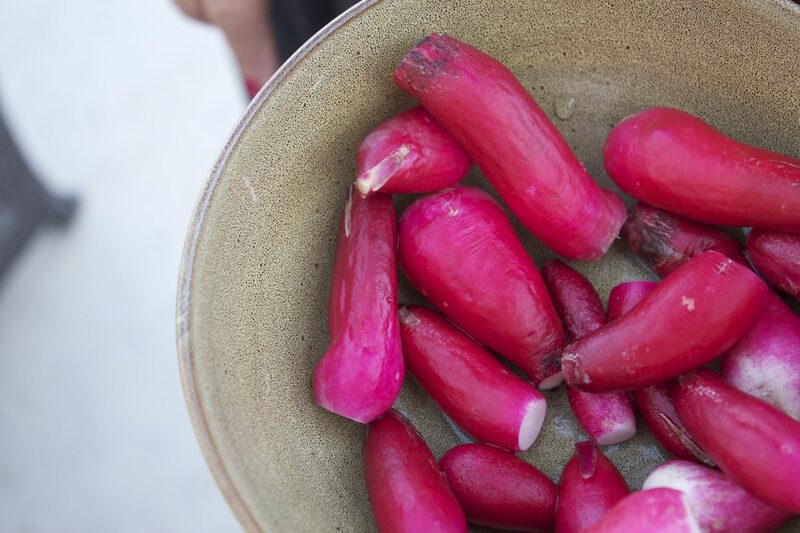 Like many others, I am a sucker for the spices that accompany this time of year, and appreciate the warmth they bring to any dish. But pumpkin pie, in particular, with its creamy pumpkin custard speckled with warm cinnamon and nutmeg, encased in a flaky crust and dolloped with fresh whipped cream? Well, that is a can’t-miss dish for me, and I can’t imagine ending a festive fall meal without it. It’s no wonder that for generations, pumpkin pie has been the go-to dessert for American families. 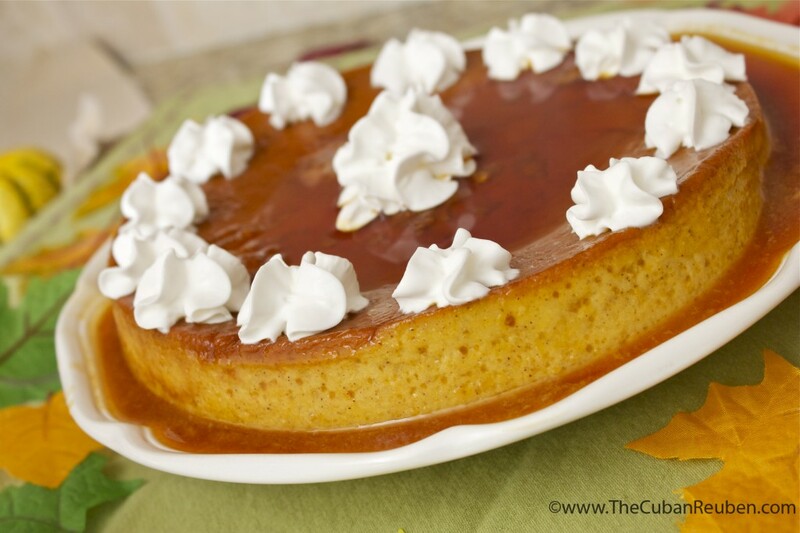 Several years ago, during one of our many get-togethers, my mom pulled a fast one on the family, and replaced our much beloved pumpkin pie with the less traditional pumpkin flan. And while there were many skeptics in the bunch (myself included), once they had a single taste of the creamy, rich flavor and burst of spice from a little orange-tinged bite of the pumpkin flan, there was simply no going back. The verdict was in. We had a new fall dessert! Since then, serious jeers abound if we get together in the fall, and there is no pumpkin flan in sight. 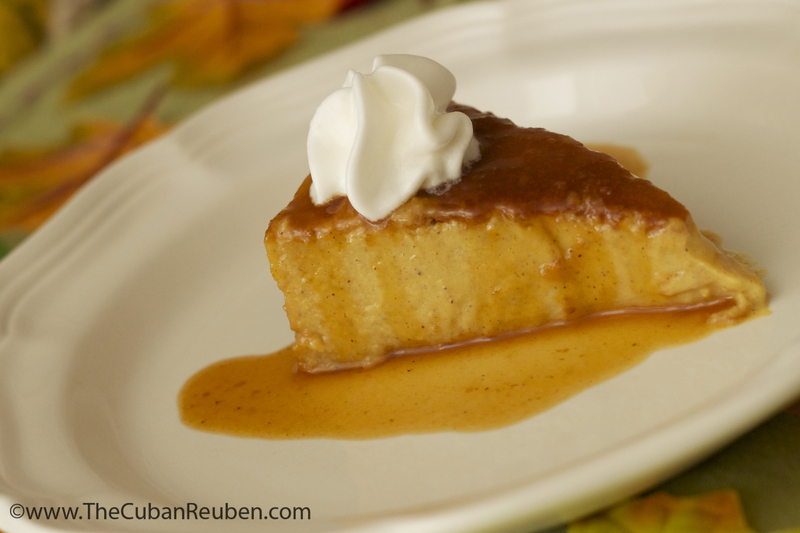 A slice of the creamy pumpkin flan. I understand that flan, in general, is a polarizing dish. Trust me, I’ve tasted my fair share of egg-y, rock solid, just plain bad flan. But if you’ve never tried Cuban-style flan, you’re doing yourself a disservice, as its thick, creamy custard with sweet caramel sauce oozing down the sides, is more akin to a crust-less cheesecake than anything else. And when you combine that with the distinct flavors of fall that can only be found in a pumpkin pie, what results is an undeniably can’t-miss dish. It’s truly a perfect ending to any fall festive meal, whether it’s Thanksgiving, Shabbat, or in this year’s case, even Channukah. Promise. A perfect finish to any of Fall's festive meals. Mix first seven ingredients (from evaporated milk to salt) in a blender, and set aside. Return the flan pan and water bath to the oven, and bake for about 70-80 minutes or until an inserted toothpick comes out clean. I recommend using a 9-inch metal cake pan. Jenny, I am literally swooning. This is a must at our house! As usual, thank you for another perfect recipe. Don’t know how you do it, but you read my mind as far as foods I love! Thanks, Jane. So glad you love these recipes as much as I do! When I realized that was flan, my mouth began to water. I am gonna attempt to follow your recipe and hope it turns out as good as yours did. You don’t know this but next to Lemon Meringue Pie, Flan is my all time favorite desert. Keep up the good eats. Yum…. I am making this in London!